L-R Jordan Pecar, William Brosnahan, Torsten Hillhouse & Mary Bacon. Courtesy of Zach Rosing. Used with permission. Whenever I travel throughout Indiana, I make it a point to avoid interstate highways so I can drive on back roads. I love the landscape, family farms and vast fields that dot the countryside and am drawn to small towns along the way. I often wonder about people who live in rural areas, especially farmers and their families, who have lived and worked on their property for generations. 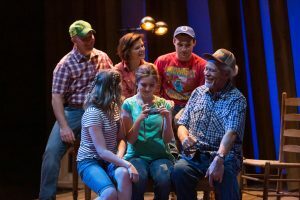 Watching “Amber Waves” at the Indiana Repertory Theatre Upperstage during Friday’s opening night performance, brought to mind the fascination I have always had with these hardworking individuals who make a living off the land, and who represent a part of our Hoosier heritage. 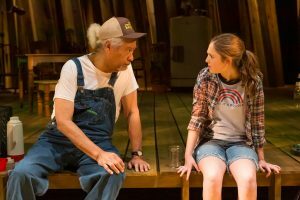 IRT playwright-in-resident James Still paints an affectionate, sometimes sad and often poignant portrait of farm life in the Midwest in “Amber Waves.” It’s a work that Still originally wrote as a one-act play, but eventually became a full-length version that premiered at the IRT in 2000. It tells the story of the Olson family that is on the cusp of losing the farm that has been in their family for several generations. It also depicts the struggles they undergo related to weather, economics and family dynamics. The Kansas-born-and-bred Still is quite familiar with the play’s subject matter, given that his grandparents and great grandparents were farmers and owned a farm that was later lost. L-R Charles Duman & Jordan Pecar. Courtesy of Zach Rosing. Used with permission. The cast included Jordan Pecar as 12-year old Deb, William Brosnahan as Scott, her high-school-aged brother, Mary Bacon as their mom Penny, and Torsten Hillhouse as their father Mike. Playing Julie, Deb’s classmate and BFF, was Riley Iaria, and performing the role of Johnny, a neighboring farmer, was Charles Dumas. All of the cast’s acting performances were uniformly impressive, an indication of the strong influence exerted by director Lisa Rothe. Particularly effective was the sibling rivalry portrayed by Pecar and Brosnahan as the constantly squabbling brother and sister, and the chemistry exhibited by Bacon and Hillhouse as loving husband and wife and protective parents. Also endearing were scenes between Pecar, as inquisitive Deb, and Johnny, the kindly, elderly farmer, who she befriends. The interactions between Pecar as Deb and her affluent friend Julie played by Iaria, and all the characters for that matter, pointed out the tremendous ear Still has for dialogue, and in this case, the Midwest vernacular, in particular. I heard from various sources that Still had updated the script with modern references which became quickly apparent as soon as characters began using cell phones, ear phones and an IPad as props in the play. Like many American families struggling with how to cope with technology that creates barriers in personal communication, Penny’s concerns about her kid’s preoccupation with it, demonstrated that farm families face the same challenges as their urban counterparts. Conversely, reinforcing that technology can also make life more efficient, Penny works at a lap top as she attempts to manage the family’s finances. 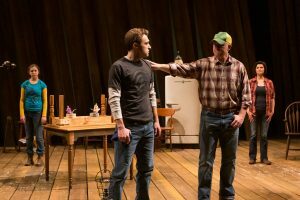 Synthesizing Still’s themes of the land and the seasons, was the marvelous country/folk musical score of Tim Grimm and Jason Wilber that beautifully enhanced the play. It was played live by Grimm on guitar and Appalachian-born Rachel Eddy, who played a variety of stringed instruments, including a fiddle, banjo and mandolin. Narelle Sissons’ abstract set design, Theresa Squire’s on-point costumes and Mary Louise Geiger’s lighting design all combined to create an environment and atmosphere that reflected a place, its inhabitants and a way of life, slowly going by the wayside that anyone brought up in these parts can identify with. A gentle tale, it is also one that reinforces the importance of family sticking together to face adversity with faith, hope and optimism, that life will, indeed, get better. “Amber Waves” continues through April 28 at Indiana Repertory Theatre’s Upperstage. For information and tickets call (317) 635-5252 or visit irtlive.org.